Ensuring your Java application is running at peak performance can take some effort. Here's how you can help ensure the performance of your Java application is top notch. In this article, we’ll discuss a number of approaches that can be helpful for improving the performance of a Java application. We’ll start with how to define measurable performance goals and then look at different tools to measure and monitor application performance, and identify bottlenecks. We’ll also look at some of the common Java code level optimizations as well as best coding practices. Finally, we’ll look at JVM specific tuning tips and architectural changes to improve the performance of a Java application. Note that performance optimization is a wide topic, and this is only a starting point for exploring it on the JVM. Before we start working on improving the performance of the application, we need to define and understand our non-functional requirements around key areas such as scalability, performance, availability, etc. Using metrics like these which can be measured via different load testing and application monitoring tools helps to identify key bottlenecks and tune performance accordingly. Let’s define a baseline application we can use throughout this article. We’ll use a simple Spring Boot web application – like the one we created in this article. This application is managing a list of employees and exposes REST APIs for adding an employee and retrieving existing employees. We will use this as the reference to run load tests and monitor different application metrics in the upcoming sections. Load testing tools and Application Performance Management (APM) solutions are commonly used to track and optimize the performance of Java applications. Running load tests around different application scenarios and simultaneously monitoring CPU, IO, Heap usage, etc. using APM tools are key to identifying bottlenecks. Gatling is one of the best tools for load testing which provides excellent support of the HTTP protocol – which makes it an excellent choice for load testing any HTTP server. Stackify’s Retrace is mature APM solution with a rich set of features – so naturally, that’s a great way to go to help you determine the baseline of this application. One of the key components of Retrace is its code profiling which collects runtime information without slowing down the application. Retrace also provides widgets for monitoring Memory, Threads, and Classes for a running JVM based application. Other than application metrics, it also supports monitoring CPU and IO usage of the server which is hosting our application. So, a full-fledged monitoring tool such as Retrace covers the first part of unlocking the performance potential of your application. The second part is actually being able to reproduce real-world usage and load in your system. That’s actually harder to achieve than it looks, and it’s also critical to understand the current performance profile of the application. That’s what we’re going to be focusing on next. Gatling simulation scripts are written in Scala, but the tool also comes with a helpful GUI, allowing us to record scenarios. The GUI then creates the Scala script representing the simulation. And, after running the simulation, we Gatling generates helpful, ready-to-analyze HTML reports. Before launching the recorder, we need to define a scenario. It will be a representation of what happens when users navigate a web application. In our case, the scenario will be like, "Let us start 200 users and each makes 10,000 requests." 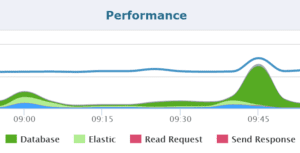 Load testing the API’s of an application is helpful in finding subtle, hard to find bugs like DB connections getting exhausted, requests getting timed out during high loads, undesirable high heap usage due to memory leaks, etc. To get started with using Retrace for a Java application, the first step is to sign up for a free trial here, on Stackify. Next, we’ll need to configure our Spring Boot application as Linux service. We’ll also need to install Retrace agent on the server where our application is hosted as mentioned here. Once we have started the Retrace agent and Java application to be monitored, we can go to Retrace dashboard and click AddApp link. Once this is done, Retrace will start monitoring our application. Is a certain SQL statement slowing us down? Is Redis slower all of a sudden? Specific HTTP web service down or slow? For example, below graph provides insights around slowest part of the stack over a given time duration. Load testing and application monitoring are quite helpful in identifying some of the key the bottlenecks in the application. But at the same time, we need to follow good coding practices in order to avoid a lot of performance issues before we even start application monitoring. Let’s look at some of the best practices in the next section. String concatenation is a very common operation, and also an inefficient one. Simply put, the problem with using += to append Strings is that it will cause an allocation of a new String with every new operation. Using the StringBuilder in the code above is significantly more efficient, especially given just how common these String-based operations can be. Before we move on, note that the current generation of JVMs does perform compile and or runtime optimizations on Strings operations. Recursive code logic leading to StackOverFlowError is another common scenario in Java applications. If we cannot do away with recursive logic, tail recursive as an alternative is better. Other JVM languages, such as Scala, already have compiler-level support to optimize tail recursive code, and there’s discussion around bringing this type of optimization to Java as well. Regular expressions are useful in a lot of scenarios, but they do, more often than not, have a very high performance cost. It’s also important to be aware of a variety of JDK String methods, which use regular expressions, such as String.replaceAll(), or String.split(). Using a popular library like Apache Commons Lang is also a good alternative, especially for manipulation of Strings. Creating and disposing of threads is a common cause of performance issues on the JVM, as thread objects are relatively heavy to create and destroy. If your application uses a large number of threads, using a thread pool makes a lot of sense, to allow these expensive objects to be reused. To that end, the Java ExecutorService is the foundation here and provides a high-level API to define the semantics of the thread pool and interact with it. The Fork/Join framework from Java 7 is also well-worth mentioning, as it provides tools to help speed up parallel processing by attempting to use all available processor cores. To provide effective parallel execution, the framework uses a pool of threads called the ForkJoinPool, which manages the worker threads. How many different applications we are planning to deploy to a single JVM process, e.g., the number of EAR files, WAR files, jar files, etc.? How many Java classes will be potentially loaded at runtime; including third party API’s? Estimate the footprint necessary for in-memory caching, e.g., internal cache data structures loaded by our application (and third party API’s) such as cached data from a database, data read from a file, etc. Estimate the number of Threads that the application will create. These numbers are difficult to estimate without some real-world testing. The most reliable way to get a good idea about what the application needs are, is to run a realistic load test against the application and track metrics at runtime. The Gatling-based tests we discussed earlier are a great way to do that. Stop-the-world garbage collection cycles used to represent a huge issue for the responsiveness and overall Java performance of most client-facing applications. However, the current generation of garbage collectors has mostly solved that issue and, with proper tuning and sizing, can lead to having no noticeable collection cycles. That being said, it does take an in-depth understanding of both GC on the JVM as a whole, but also the specific profile of the application – to get there. Tools like a profiler, heap dumps, and verbose GC logging can certainly help. And again, these all need to be captured on real-world load patterns, which is where the Gatling performance tests we discussed earlier come in. For more information around different Garbage Collectors, have a look at this guide here. Relational databases are another common performance problem in typical Java applications. In order to get to a good response time for a full request, we have to naturally look at each layer of the application and consider how the code interacts with the underlying SQL DB. Let’s start with the well-known fact that database connections are expensive. A connection poolingmechanism is a great first step towards addressing that. A quick recommendation here is HikariCP JDBC – a very lightweight (at roughly 130Kb) and lightning fast JDBC connection pooling framework. Another aspect of the way we handle persistence is trying to batch operations wherever possible. JDBC batching allows us to send multiple SQL statements in a single database roundtrip. The performance gain can be significant both on the Driver and the database side. PreparedStatement is an excellent candidate for batching, and some database systems (e.g., Oracle) support batching for prepared statements only. Hibernate, on the other side, is more flexible and allows us to switch to batching with a single configuration. Next, statement caching is another way to potentially improve the performance of our persistence layer – a less-known performance optimization that you can easily take advantage of. Depending on the underlying JDBC Driver, you can cache PreparedStatement both on the client-side (the Driver) or databases-side (either the syntax tree or even the execution plan). Database replication and sharding are also excellent ways to increase throughput, and we should take advantage of these battle-tested architectural patterns to scale persistent layer of our enterprise application. Memory prices are low and getting lower, and retrieving data from disk or via a network is still expensive. Caching is certainly one aspect of application performance we shouldn’t overlook. Of course, introducing a stand-alone caching system into the topology of an application does add complexity to the architecture – so a good way to start leveraging caching is to make good use of existing caching capabilities in the libraries and frameworks we’re already using. For example, most persistence frameworks have great caching support. Web frameworks such as Spring MVC can also leverage the built-in caching support in Spring, as well as the powerful HTTP-level caching based on ETags. But, after all of the low-hanging fruit is picked, caching frequently accessed content in the application, in a stand-alone caching server such as Redis, Ehcache or Memcache can be a good next step – to reduce database load and provide a significant boost to application performance. No matter how much hardware we throw at a single instance, at some point that won’t be enough. Simply put, scaling up has natural limitations, and when the system hits these – scaling out is the only way to grow, evolve and simply handle more load. Unsurprisingly, this step does come with significant complexity, but it’s nevertheless the only way to scale an application after a certain point. And, support is good and always getting better, in most modern frameworks and libraries. The Spring ecosystem has an entire group of projects specifically built to address this particular area of application architecture, and most other stacks have similar support. Finally, an additional advantage of scaling with the help of a cluster, beyond pure Java performance – is that adding new nodes also leads to redundancy and better techniques of dealing with failure, leading to overall higher availability of the system. In this article, we explored a number of different concepts around improving the performance of a Java application. We started with load testing, APM tool based application and server monitoring – followed by some of the best practices around writing performant Java code. Finally, we looked at JVM specific tuning tips, database side optimizations, and architectural changes to scale our application.